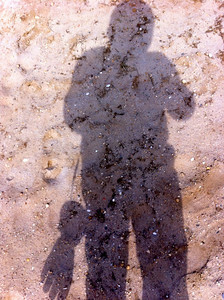 Sometimes when I leave my house, the sun at my back – I take a strange comfort in seeing my shadow riding along with me. Seeing it makes me feel like I’m “going somewhere”. Over time you start to become familiar with where your shadow should be on the ground given the time of day. It becomes your constant companion. As I stood alone at the edge of the beach this morning, it was there with me once again. But today was different. It was the first time that I realized that my shadow is nothing more than a nondescript outline of a person. All of the bells and whistles that make the me in me were hidden. Noun: A dark area or shape produced by a body coming between rays of light and a surface. Still nice to have the companion though! I love trying to take pictures of my shadow as I’m riding. It’s fun also to watch as your shadow changes throughout the day and find the time of day when the shadow most resembles your actual shape. Depending on the lighting, shadows can be like circus mirrors. I’m with you on liking the taller version of my shadow. J/K I’ve done the same thing. Gotta be careful when riding, not to keep watching the shadow, lol.